The tank is designed to provide maximum thermal stratification, with the goal of having the tank top near 80°C during winter months, and 50-55°C in the summer. In the winter, the boiler heats the tank whenever the boiler is making more heat than the house zones can absorb. In turn, the tank provides heat to the house zones when the boiler is not active. Part of the challenge is in determining the best insulation. The tank is be located outside, where temperatures can reach -30°C (-25 °F). Wood gasification boilers burn most efficiently at constant high temperatures. The ideal pattern is to run at full output for a while, then shut down for a while. 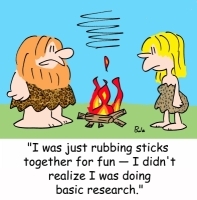 There is some loss during startup and burnout. The boiler has a peak heat output of 70,000 to 80,000 btu/hr. The house needs an average of approximately 300,000 to 350,000 btu/day during the heating season. This means that on average, the boiler needs to run at full output for four or five hours per day. The problem with this is that the house, hot water heater, and hot tub need heat throughout the day. Furthermore, there is no place to dump as much heat as the boiler can generate during a five hour run. If all house heating zones are demanding heat, they can absorb at most 30,000 btu/hr. When the hot tub needs heat, it can absorb 40,000 btu/hr, and typically requires 10,000 btu per heating cycle. The domestic hot water heater can absorb about 100,000 btu/hr, but requires only 20,000 btu per cycle. As a result, even if everything is cool when the boiler is fired, after an hour or two everything will be warm. During the summer, the solar panel has many of the same issues. It generates much more heat during a sunny day than is needed. However, it generates nothing during many of the times that hot water is used. The solution is to provide a mechanism to store heat. By far the most cost-effective technique is a big insulated tank of water. If heat exchanger coils are going to be placed in the tank, the tank will need an open top. In an application where hot water baseboards are used (or where there is a need to really maximize the amount of stored heat), water may be handled and stored at temperatures of 180 deg F. Many plastics will lose strength over time at these temperatures. Polypropylene is one of the few low-cost heat tolerant plastics that is widely used to make barrels. A group of polypropylene barrels could be a storage option. In considering metal barrels, be aware that galvanic corrosion could be a problem. This would particularly be a concern with steel tanks and copper plumbing. This project is using a stainless steel tank purchased from a local scrap metal dealer. If a tank can be provided with enough capacity to store a day's worth of heat, it's possible to be clever and time the fire so that days can be skipped much of the time. How many btu/day is needed? How long a period must be satisfied with stored heat? How high a temperature can the tank be heated to? What is the lowest temperature of tank water that is usable for heating? What degree of thermal stratification will there be? The boiler puts out hot water at a maximum of just over 180 deg F. Assuming a starting tank top temperature of 180 deg F and a minumum usable outlet temperature of 160 deg F (reasonable for hot water baseboard heat), a tank of 2100 gallons would be needed to store one day's worth (350,000 btu) of usable energy. What is the largest tank that can reasonably fit in available locations close to the boiler? What can be found at an affordable price that will fit in that space? In this case, the answer was an 880 gallon stainless steel tank that fits under our deck adjacent to the boiler room in the basement. Given a less than desired tank volume, what is the best way to make use of the available heat storage capacity? Add a radiant floor heat zone for the main floor to use lower temperature water. Have a controller that can make good decisions about when to heat the hot tub. Use a separate 'preheat' coil in the bottom of the tank to preheat domestic hot water. The radiant floor idea has the most potential impact. If it is possible to heat with water down to 120 deg F, the 880 gallon tank would give 440,000 btu of usable heat storage - more than a day's worth. In this implementation, the water in the tank stays in the tank and does not circulate. Heat exchangers transport heat to and from the tank. A two-section rectangular spiral with 70' of 1" copper for the solar panel. A 50' coil of 3/4" copper for the domestic hot water. 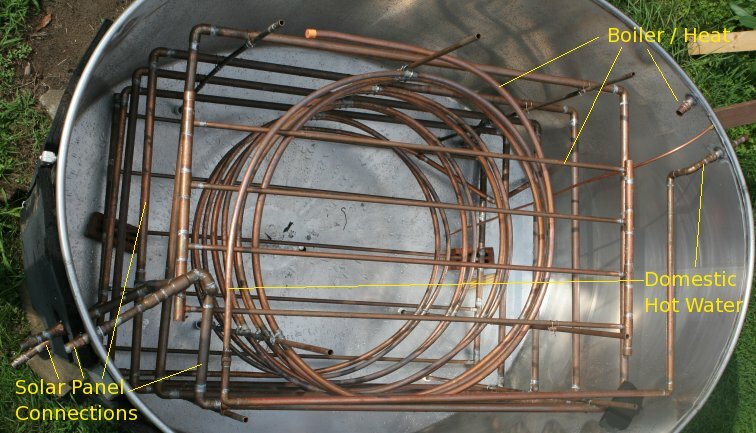 A 50' coil of copper with an additional 40" x 60" flat multipipe section at the top and bottom of the tank. While each of these may be larger than needed, it would be extremely difficult to add exchanger surface area after the tank is installed. One goal of this project is to gain real-world performance data on the effectiveness of these heat exchangers.